Sweeping changes are coming to SNF payments. Are you ready? When RCS-1 was proposed to replace PPS RUG-IV in 2017, we all doubted that it would be implemented on October 1, 2018. To no one’s surprise, the new payment system has been delayed. With PDPM (the revised version of RCS-1), you may be just as doubtful of its start date. Be assured that CMS is working out the kinks, and this time change is coming! The new PDPM payment system will take effect October 1, 2019. Have you begun preparation? Are you working with your trusted partners to hit the ground running? 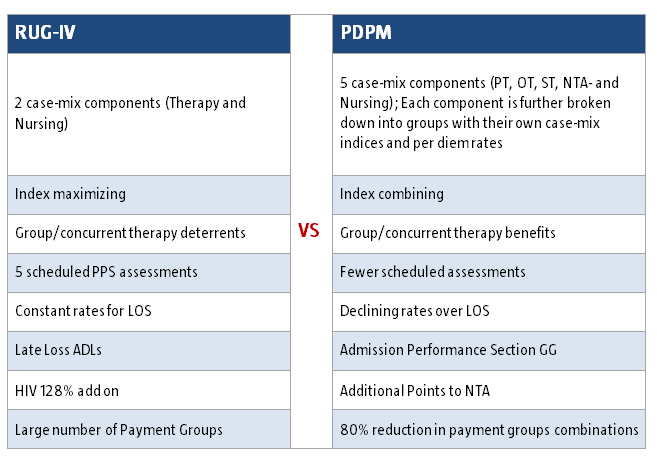 PDPM stands for Patient-Driven Payment Model, and it is a revised version of RCS-1 (Resident Classification System) that was proposed in 2017. PDPM is a total replacement of the PPS RUG-IV system, and uses a completely different way to calculate payments. CMS says that the proposed model is designed to drive person-centered care by taking into consideration the needs and goals of the whole person, as opposed to measuring the volume of patient services received (e.g. therapy). The goal of PDPM is to recognize the varied needs and characteristics of each resident. PDPM represents a complete change of philosophy where the provision of less therapy is incentivized. With PDPM, each resident is assigned to a classification that drives that resident’s reimbursement rate for the length of their stay. There is one scheduled assessment at five days. In that assessment, the resident is given a classification that determines payment classification for their entire 100 days of Medicare coverage. The only additional assessment would be an interim payment assessment (optional only if applicable during stay) and the required discharge assessment. Unlike the PPS COT (Change of Therapy), the IPA has a list of specific requirements to be met in order to be completed. To prove person-centered care was delivered, CMS will add two new reporting requirements to PDPM’s mandatory discharge assessment – 1) documentation of therapy minutes and each therapy mode used, and 2) days for each discipline and mode of therapy. The admission MDS primary diagnosis (item 18000 in Section 1) will drive which ICD-10 based clinical category is used for each resident. The five case mix components for PDPM are PT, OT, SLP; Nursing; and Non-Therapy Ancillary, each of which are broken down into groups. Assignment into each of the component groups is determined by completing specific steps. These steps are related to cognition, ICD-10 diagnosis, and functional score as found on the MDS. CMS will allocate federal rates (per diem) for each component, which is combined and added to the non case-mix per diem rate to determine the overall daily rate per resident. Group & concurrent therapy allow for a total of 25%. With PDPM, up to 25% of each patient’s therapy can be in the group and/or concurrent setting. A minimum of 75% of individualized therapy is expected per patient, and CMS will watch this threshold carefully, as they expect therapy providers could try to reduce their own costs by overusing group/concurrent therapy. What are the financial implications to SNFs? Overall, PDPM is expected to be budget neutral. CMS expects total reimbursements will be close to what they are now. SNFs could see a positive impact to revenues and margins because more dollars will be allocated to nursing services. Additionally, SNFs should expect significant cost savings because fewer assessments will mean less administrative burden. Overall payments to SNFs could increase by 2.4% in 2020. If your organization would like to estimate the potential impact of the PDPM model on Medicare Part A payments, CMS has developed a provider-specific impact analysis file. This tool retrieves your SNF’s provider and resident data from FY 2017, and calculates estimated payments under PDPM, assuming no changes in provider behavior or resident case-mix. During implementation, CMS will be collecting data per SNF and across the country. In particular CMS will be watching the delivery of therapy services. It is anticipated CMS will be monitoring if therapy utilization, and if therapy is significantly reduced, this could likely lead to more intensive auditing. CMS is accepted comments on the proposed rule until June 26, 2018. On June 8, 2018 in response to stakeholders identifying typographical and usability issues with SNF PDPM classification logic, CMS posted revised versions of the following tools: SNF PDPM Classification Walkthrough, SNF PDPM Grouper Tool, and SNF PDPM NTA Comorbidity Mapping. Find the revised files and other resources at this link. Therapy Management, Inc. is working in conjunction with LeadingAge Michigan and industry experts to anticipate and plan for PDPM, so transition to the new payment system will be as efficient as possible for our partners.